Textural accents make any room come alive. 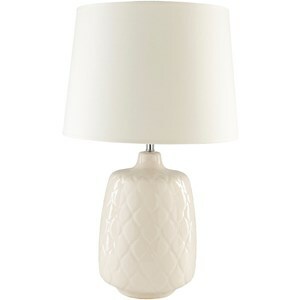 That's exactly what the Claiborne Table Lamp achieves with it's aeneous ceramic base. The ivory cotton bell shade gives the lamp the neutrality to fit into any room. The Claiborne Coastal Table Lamp by Surya at Hudson's Furniture in the Tampa, St Petersburg, Orlando, Ormond Beach & Sarasota Florida area. Product availability may vary. Contact us for the most current availability on this product. Browse other items in the Claiborne collection from Hudson's Furniture in the Tampa, St Petersburg, Orlando, Ormond Beach & Sarasota Florida area.